I mean, obviously the special people are exempt. Thanks, Jen. Does "everyone" release the handles at the same time? Does someone yell out "On 3, everyone release the handle!"? I'm really confused. Superman, for example, can rip the handle off with his bare hands to make the gas flow, then use the 5 seconds he saved to fly to the other side of the world and plug up a volcano that's threatening to destroy an island. @Michael--I was thinking the exact same thing, and giggling at the thought of that actually happening. On a totally different subject, I haven't seen an old "analog" gas pump like that in years. They're not analog, they're "LED." @WildaBeast, never mind that, i wanna know how did someone get 15.5 gallons of gas for $00.00????? 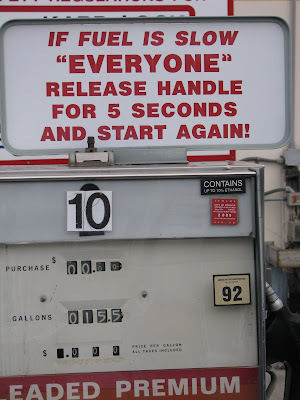 @toep, the gas was so expensive that it ran to the hundreds - this pump couldn't accommodate such a high number! for under the table incontinence drugs? pretend there is a phone here!